Its already summer vacation for kids in India, I really wish to have those holidays again to enjoy the whole day playing and munching. So many varieties of of home made snacks, sweets will be stocked in the boxes. We used to have restless play from the morning and only rest time is the eating time like breakfast, lunch, snack time in the evening and Dinner. I miss all those wonderful golden days now. Ok coming to the snack time we used to have variety of snacks.. 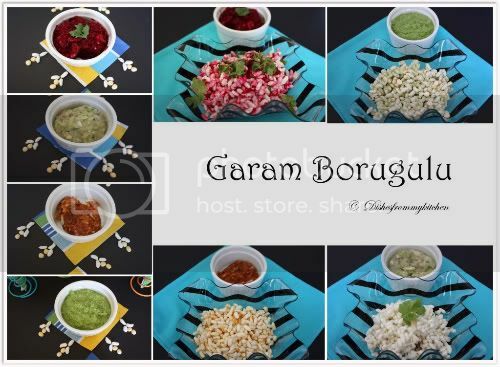 The garam borugulu which I am sharing today is the puffed rice snack. I don't know exactly why they call with the word 'Garam' may be garam in Hindi means hot you can take it as spicy too. Yah this snack you can make it according to your spicy level and you can call it as South Bhel puri too. Ok whatever the name may be its is one of our favorite snack for everyone almost have everyday with different flavors. There are lot of items that you can do with puffed rice like bhel puri, upma, dosa, seasoning the borugulu, Sweet balls made out of jaggery etc the list goes. This is really interesting and yummy which you can make with 4 different flavors or mixtures. Very easy to make and all you need is Borugulu(puffed rice) in Handy. 1.Just in big bowl have some puffed rice and few drops of coconut oil mix well so that all the borugulu is well coated with oil. 2.Add your favorite flavor according to your spice level and mix well. So that everything should be well blended. 3. Serve in a bowl with spoon.. ready for munching!!!!! You can do all this garams ahead of time or when ever you find time. Store in the air tight container refrigerate. This stays good for 4 to 5 days. Use when needed. 1. Mix all the above ingredients until well blended. 2. Store in the air tight container. 1. Put all the ingredient in the mortar pestle or in the blender and coarsely whip it. 2. Store in the airtight container. 1. Coarsely grind all the ingredients in the blender. 1. First crush the garlic using the mortar pestle and add all other ingredients. 2. Coarsely mix everything and use when needed. 1. Increase or decrease the spicy and sourness according to your taste. 1. You can substitute the Beets with carrot, or mix both. 2. 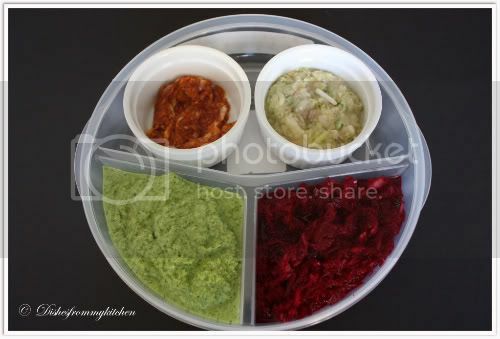 The Beet mixture can also be used as sandwich filling for thattai's. Which is crispy billalu. 3. You can use the coconut cilantro mixture for the side dish for Dosa and Idli too .. tastes yumm. You have always made simple things looking so beautiful! wow!!!!!!! making me hungry.Perfect evening snack.Love the click. What a fabulous spread, my dear! I love this variety in the Masalas for the pori. Can I come over for some yummy snacking to your place? Pori with lot of topping i like it. Why did you move? Really? Can't you come back here? This looks like Gourmet Pori! Not just fun stuff. Love the different variations. Gorgeous and I bow down to your creative skills! Lovely snack pavithra....am really mesmerized by your presentation. Wow the dish looks very colourful.U presented it very well.Keep it up nice work. Lovely snack and so beautifully and creatively captured on camera. Loved all the diff combinations !! Awesome presentation & Clicks to go with it...!! Woww such a beautiful snacks...definitely makes me hungry..
wow..this is new to me...nice click as usual.thx for sharing! Never heard of this snack. It looks yummy..and great presentation and pics!! Lovely, mouth watering and nice presentation. Too good. Wow, the clicks are beautiful. I add cilantro and raw onion too. Simple and tasty Snacks !! This is such a great post! Thanks for the info. I will have to try these. Cute and lovely presentation. Nice snack. I love this. yumm yumm yumm.. looks so delicious and lovely presentation as always! 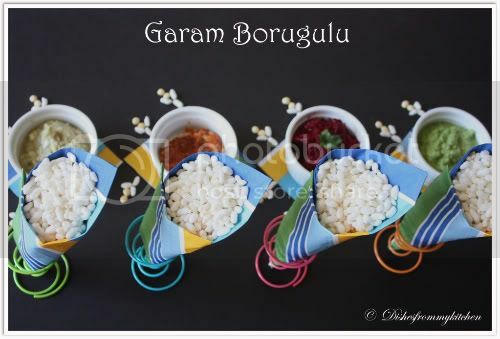 I have always thought Garam is the speciality of Karur . To be frank, I havent had it anywhere else other than my native. This is surprising to see garam here. Pavi if you dont mind can you tell me where do we get garam in India. Amazing, I can just live my life only with garam. The post was pleasure to eyes ! 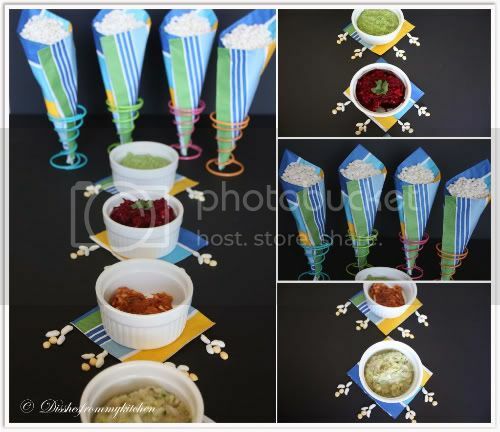 Pavithra I would seriously suggest you to think abt food styling, you are damn good yaar! Pls do think abt it! lovely snack items that both kids n adults will love. Oh wow.. i've never had pori this way... sounds really fun and as always I love the presentation. Thanx for leaving a comment @ my place!! 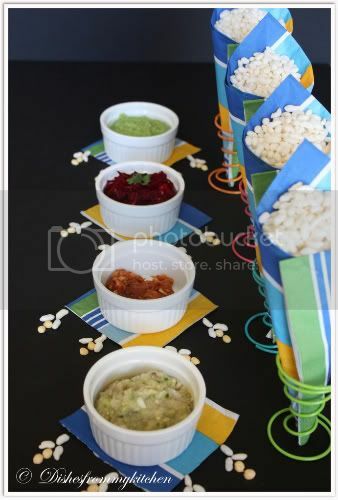 What a delicious array, Pavithra! I love how you've demonstrated so many different and delicious ways of serving up one ingredient. I would love to have one-- or all of those-- right now. Garam borugulu (carrot-beet combination) is my all time favourite. I relish this chaat item in my native with my friends during school days. Will have to definitely try the on the garlic garam (which is new to me) sometime. You have a lovely and impressive blog with all the yummy recipes. Had just went through all the items at a once today. You must be a really great cook since you have prepared surruta polli single handedly. All those telugu recipes reminded me of my days back at home. Eye pleasing varieties! They are unique! Nice presentation. 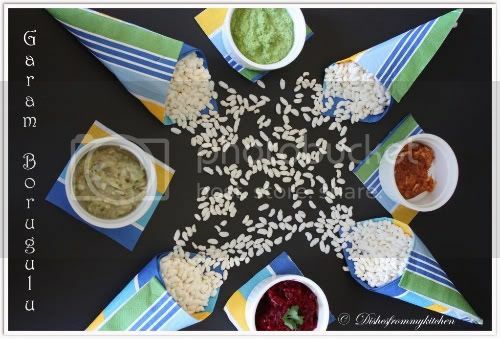 Will try this soon,my son loves puffed rice. Hey Pavithra, thank u for visiting my site and leaving a comment. These garam borugulu looks really good. Love the way they have been presented! lovely presentation.do visit my blog when you find some time.following you. Nice snack - great photos too. wow!wow!what a super simple snack?? I have no words to express how beautifully you have photographed this. Your presentation skills are amazing. Wow Pavithra! I wonder how I missed seeing this post on your page. Love all the flavors, so easy to make! Will buy pori today itself and try some of these! Beautiful presentation. Will surely try these recipes.